Roberta O’Keefe Recognition Award: To recognize an OPEG member involved with serving and promoting OPEG in an exceptional manner. Nominees must have held one or more OPEG offices or committee chairs; promoted OPEG programs at the local, regional, or state level; completed or engaged in several OPEG special assignments; and have been active OPEG members for 5+ years. Evaluation Recognition Award: To recognize an individual and/or special body of evaluation work. Nominees must have conducted quality program evaluation; promoted evaluation efforts at the local, regional, or state level; completed or engaged in an exceptional study; and conducted or participated in a number of evaluation studies. at the Spring Exchange in May. When OPEG first decided to produce a web page in the late 90s they searched for someone to host, build, and support the new site and began a working partnership with Randal Rust at R.Squared Communications. Randal helped OPEG build the site, add content, and supported various new features over time like uploading files for members to download, providing links to our member surveys, and helping us to integrate online payment so we could accept credit cards as well as checks for conference registration and membership dues, making the site more convenient for members and easier for OPEG Board members to handle. In the last year and a half OPEG discussed some of its goals with Randal: hopes of integrating a membership management, event management, and more dynamic content for our members. Randal asked about our budget and goals and with a long-standing knowledge about our needs advised us about potential services and some of the aspects we would need to consider as we looked at our options. With his guidance in hand OPEG Board members reviewed options and selected a new vendor that can provide the services OPEG has grown into, and during that switchover Randal assisted in providing the technical codes to smoothly roll over our domain name with no interruption for OPEG members. Since R.Squared Communications and OPEG started out together we have both grown and Randal has expanded his list of clients. 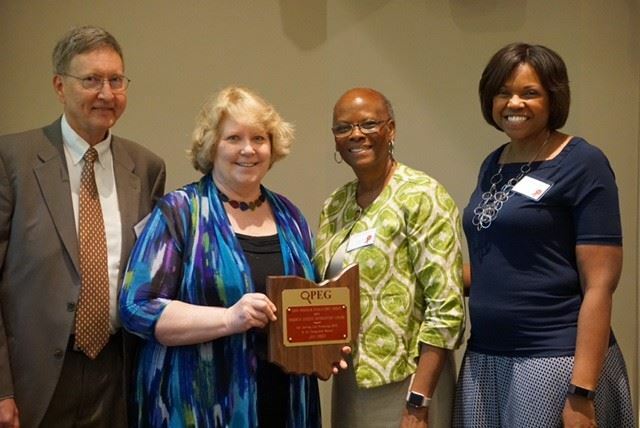 OPEG will always be grateful for the years of service and assistance that has helped OPEG provide easy, accessible information for its members. Randal was not able to attend the Exchange and sent this note: "I would like to thank the members of OPEG for being named the recipient of the 2012 Roberta O'Keefe Award. Back in 1999, I signed a contract with OPEG to develop their first website. OPEG became the very first client for R.Squared Communications, and 13 years later I was happy to help OPEG move on to a web-based solution that met their growing needs. As my company has grown, I have never forgotten, nor will I ever forget, that it all started at my kitchen table with Candace Peters and OPEG. I wish you the best of luck and thank you very much for your recognition of the effort over the years." Through her coursework Dr. Meyer is training the next generation of evaluators. She teaches a hands-on graduate level course in program evaluation in which clinical psychology students are required to carry out an evaluation project with a community partner. Through this course students become familiar with basic concepts and practice in program evaluation while providing valuable services to community organizations. Students in the class assist community organizations in implementing needs assessments, selecting outcome indicators, designing survey instruments, and conducting research that measures the impact of their programs. An important part of the course is that one or two students spearhead each community evaluation project but all students in the class engage in a group consultation process so that each class member offers input on the evaluation design of their peers’ projects. This method increases the “brain power” applied to each project and the likelihood that evaluations of community programs are approached from multiple perspectives. Students are required to produce an evaluation report for their community partner that translates technical findings into user-friendly language understandable to community audiences. This report can be used to meet funder evaluation requirements. Additionally in most cases the agency is left with a product or system that be used in their future evaluation efforts. Students benefit from the course by gaining technical skills and experience in program evaluation, learning how to work effectively in a team and how to collaborate with community organizations in a professional capacity. Community organizations benefit from getting free, high quality evaluation services and reusable evaluation resources. To date, eighteen local, state, or national organizations have benefited from the work of the graduate students in the course. They include: Springfield City Schools; Wright State University Campus Dialogue on Race; the Center for Healthy Communities (Grandparent/Grandchildren Initiative and Community Advocate programs); Clark County Juvenile Court; the Levin Family Foundation; the Dayton Bar Association; Clark County Family Services; Choices in Community Living, a residential program serving adults with mental retardation; Dayton Public Schools; Clark County Child Advocacy Center; Montgomery County Juvenile Court; South Community Mental Health Center; the Association for Specialists in Group Work - National Research Committee; Yellow Springs Schools; Public Health-Dayton and Montgomery; the Ohio Commission on Minority Health; and the Lupus Foundation of America. 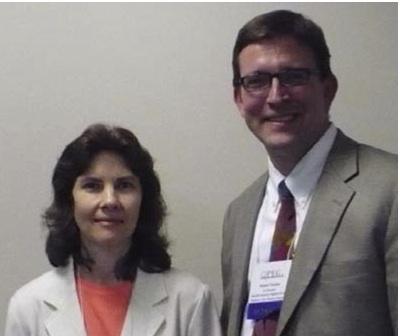 In May, 2011, Rob Fischer, OPEG’s immediate past President, received the Roberta O’Keefe Recognition Award for outstanding service to the organization. Currently, Rob is the Co-director of Case Western Reserve University’s Center on Urban Poverty and Community Development. Rob served on the OPEG Board for many years, most recently as President from 2005 to 2011. The Board was well-served by his steady, guiding hand and wealth of institutional and historical knowledge. Upon receiving his award, Dr. Fischer surprised the audience by reading a poem he had written about his time with OPEG, which can be read here. 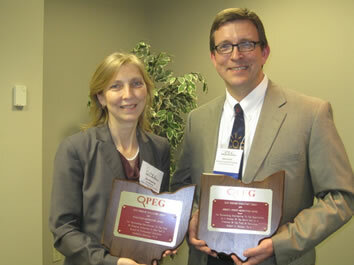 Dr. Kimberly Downing is the 2011 recipient of the OPEG Evaluation Recognition Award. A political scientist by training, Kim graduated from Michigan State University and received her Ph.D. from Rutgers University. Kim has been with the Institute for Policy Research at the University of Cincinnati since 1995, and currently serves as Co-Director of the Institute. A highly regarded public opinion researcher and scholar, Kim’s work over the last decade evaluating organ and tissue donation promotion initiatives has been particularly influential. She has conducted federally-funded studies of Ohio’s first-person consent organ donation registry and work to encourage older adults to become donors. Jan Upton received the Roberta O’Keefe Recognition Award for outstanding service to the organization. Jan served as OPEG’s Secretary (2006-2010). She has been active on the Program Committee and has presented at OPEG on evaluation planning, consulting, and institutional review board issues. 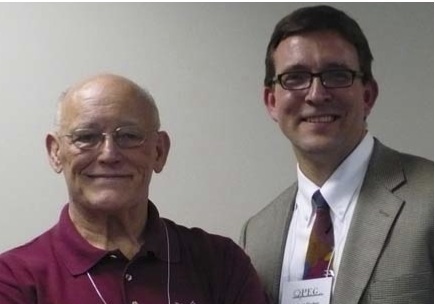 OPEG recognized Jerry Walker for his contributions to the field of evaluation. Jerry has a long-term career as an evaluation researcher and regularly presents on popular topics such as “Mucking with Education Data.